Spectators at the Kalinga stadium in Bhubaneshwar witnessed a lot of drama as Pool A teams played their 3rd round matches on 6th December. No one would have imagined that France -- being the lowest ranked team in the Hockey World Cup – would pull off such a spectacular upset against the Los Leones to advance to the knockout stages. Spain, as a result, were knocked out from the tournament. One can expect more surprises as Pool C teams get set to lock horns in the 3rd round matches. Belgium will clash against South Africa first. 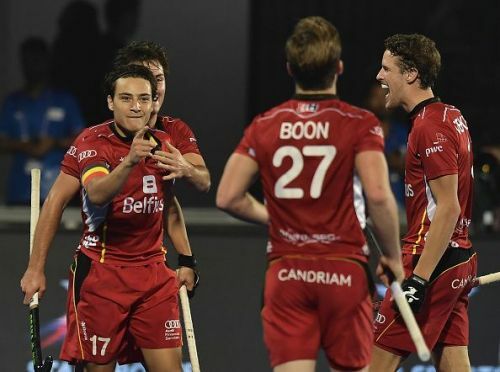 Olympic silver medalists Belgium had a few problems in their Canada 2-1 win in their first match of the tournament. Although they did dominate possession and had plenty of chances, they did not convert as well as Shane McLeod would have liked. The Red Lions got a crucial 3 points on board from this match nonetheless. Up next, Belgium were up against the hosts India. Exceptional stickwork and slick passing helped them go ahead with a goal from Alexander Hendrickx through a Penalty corner. The Men in Blue made a terrific comeback and went ahead with a goal-a-piece from the talismanic Harmanpreet and Simranjeet. The match would go on to end as a 2-2 draw as Simon Gougnard found the equalizer for the Red Lions. South Africa, on the other hand, were completely demolished by India in their first match. A brace from the talented forward Simranjeet, and a goal each from Mandeep, Akashdeep, and Lalit powered the hosts to a 5-0 win over South Africa. Mark Hopkins' troops did manage to get a point on board as they drew 1-1 against Canada in their 2nd match. Ntuli scored South Africa's goal in the match. However, the team would be disappointed with the conversion rate as they had 12 shots on goal and 24 circle entries. South Africa were clearly the better side on the day and will take positives from this game when they face mighty Belgium. 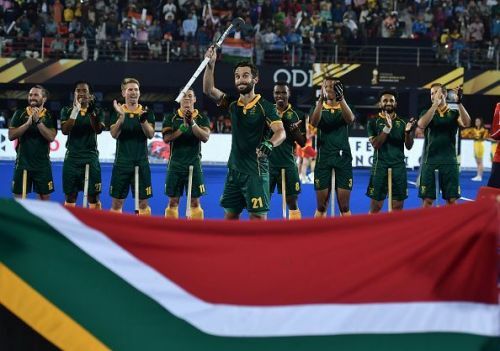 World number 3 Belgium will surely be the favourites to win the encounter against South Africa, who are placed 15 as per the FIH rankings. History is also in their favour as The Red Lions have won all 4 of the previous 4 encounters between the two. It will be a different ball game altogether for the Tim Drummond-led team as they get to face their sternest challenge yet. Even getting a draw will be difficult for South Africa in the coming match. Belgium will be pushing to win the match by a big margin as that would give them a shot at entering the quarterfinal stages directly from Pool C.